You are currently browsing the tag archive for the ‘Forest education’ tag. My daughter attended a yochien(kindergarten) that offered forest education without having advertised it as one. The school was built on a mountain slope and everyday the children spent at least an hour in “forest adventures”(mori no tanken”, climbing slopes and trees, collecting all manner of bugs. 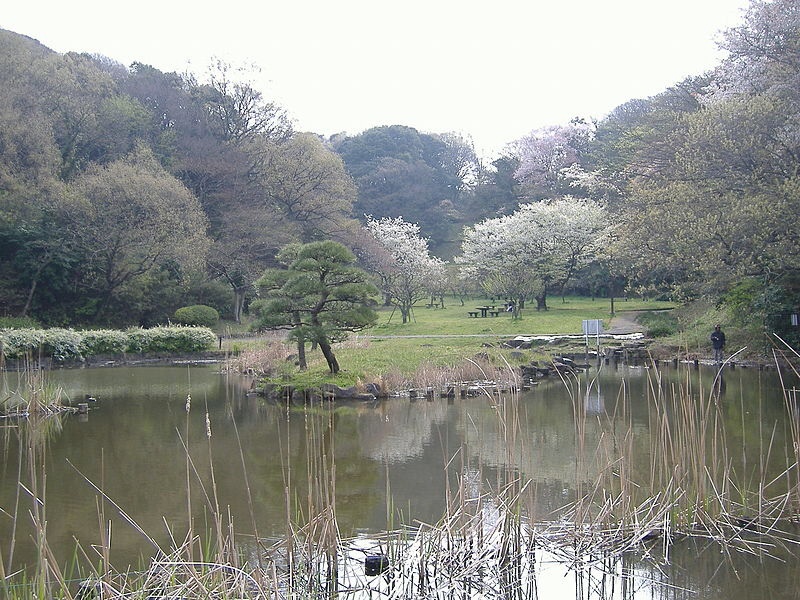 Across from the school is situated about an acre of a satoyama landscape, with marshland, a lovely pond, a spring and stream around which the kids could catch crayfish and bullfrogs. The park is beautiful in all four seasons. My daughter and the other yochien children spent many happy hours there in nature lessons, learning the names of trees, observing insects and the changing seasonal landscape, mostly in natural conversation with the teachers. Bentos were eaten picnic style several times each season in the park under open skies or under the glorious trees of blooming sakura cherry blossoms or the shade of keyaki trees. My children came home often with pillbugs or acorns in their smock pockets (kindy kids often wear smocks for outdoor play). Playing daily in all sorts of weather conditions and in such beautiful natural landscape helped them develop Japanese sensibilities and love for the familiar satoyama landscape, while toughening them up with the scraped knees (or cuts and bruises) they invariably got from time to time from all the tree-climbing and crawling over pond edges to collect or examine plant/bug specimens. Every time I pull into the train station of a different town or city, I look out for school signboards, and more often than not…tucked into some corner…there is at least one kindergarten (yochien or hoikuen) that is named Mori-no-ie or Mori-no-youchien (Forest Kindergarten). Although not every kindergarten so named, is a kindergarten offering true Forest School education, the forest school philosophy has taken root earlier than in the UK or US and is growing, according to scholars and observers. This award-winning NHK TV documentary feature called In the Heart of Nature: The Forest Kindergarten spotlights kindergartens such as the Marutanbo in Shimane prefecture and others, without walls or ceilings that epitomize the forest education, click on this link http://youtu.be/LNl5p1M96xE to watch. Ute Schulte-Ostermann, president of the German Federation of Nature and Forest Kindergartens (BVNW), reported on the Japanese situation after returning from a tour of Japan, among other countries, “Schulte-Ostermann says she thinks the US and the UK’s obsession with health and safety and regulations may have slowed adoption of the idea, but points out that forest kindergartens have proved very popular in Japan, which is also known for its red tape bureaucracy. Kido says nearly all Japanese waldkindergartens are oversubscribed despite parents being forced to cover all the costs. In Germany, however, waldkindergartens are subsidized at the same level as traditional kindergartens, meaning parents pay no more than €80 ($108) a month to place their kids at Die Kleinen Pankgrafen. What are forest schools and what is the benefits of a forest school? Geoffrey Guy’s “Forest Schools Essay” traces the beginning of the concept and schools to a Scandinavian origin, specifically to the Norwegian “Friluftsliv” fresh air living concept. Forest schools helps students develop confidence and creativity by teaching practical, outdoor skills – and teachers don’t necessarily need a woodland on their doorstep to incorporate the ideas. “Shimizu, M. et al (2002) investigated the contribution of “Skogsmulle” activities to the formation of environmental awareness and environmental literacy in Ichijima, a Japanese town. They found that children who had experienced Mulle activity within the town acquired better environmental awareness and literacy and participated more positively in community activity. From this they suggest that nature-based activities are useful particularly at the pre- school age for environmental learning. • The sickness absence difference between the nurseries was over 5%. This was consistent and uniform throughout the year with the I Ur och Skur having the higher attendance rate. • The children from the I Ur och Skur nursery had better concentration. This was verified statistically. • The I Ur och Skur children had better motor function. To climb and play on uneven ground or to play only on flat ground without trees appears to have a pronounced influence on children. With many kids today ensconced at home glued to their Nintendos, gameboys, iPhones, iPads and not just the TV sets of yesteryear, more nature-oriented kindergarten and nursery school programmes are needed in Japan to counter the toxic urban lifestyles that parents are allowing their children to adopt. edited by Sara Knight – this book reviews the history of forest education in the UK, based on the Danish model.